Rogue supernovas that explode all alone in deep space present an astronomical mystery. Where did they come from? How did they get there? The likely answer: a binary black hole slingshot, according to a new study by Ryan Foley, a professor of astronomy and physics at the University of Illinois. Using data from NASA's Hubble Space Telescope and other telescopes, Foley traced 13 high-velocity exploding stars back to the galaxies they came from to find the peculiar combination of events leading to the stars' lonely deaths. His findings are published in the Monthly Notices of the Royal Astronomical Society. Foley set out to solve the puzzle of a rare, strange type of supernova found far from any galaxies or star clusters. The supernovas are known as calcium-rich because they produce an unusually large amount of calcium. "Looking around where the supernovas exploded, there's nothing there – no trace of star formation, no clusters of old stars, there's nothing nearby," Foley said. "So I knew that these things were starting somewhere else and moving long distances before they die." Examining the locations and kinematics of the supernovas, he was able to determine that the stars that exploded had been kicked out of their galaxies at very high speeds, millions of years before they exploded. 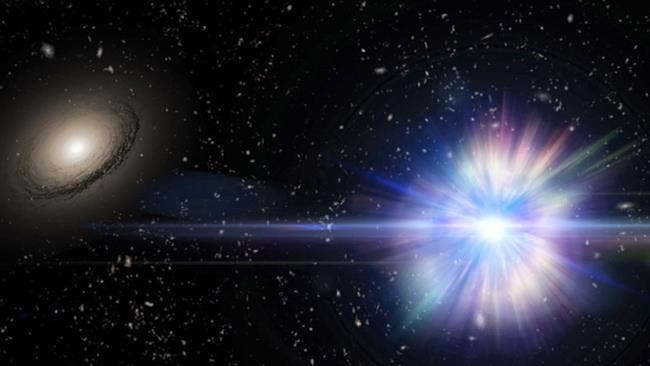 To understand how the supernovas got so far from their galaxies – up to half a million light years away – moving at such high speeds, he looked at the galaxies that had produced the stars before ejecting them. "Whatever put the star system in the state where it's about to explode is related to the center of the galaxy it came from," Foley said. First, he noticed that many of the galaxies were composed only of old stars, which meant that the calcium-rich supernovas had to come from a population of older stars such as white dwarfs. Most stars become white dwarfs after they stop producing new energy. In order to produce the kind of explosions observed, a white dwarf has to drain mass from a companion star. In this case, the two stars are in a binary system where the pair circle one other until tidal forces rip one apart. That material is dumped on the other star, which causes an explosion. Thousands of such supernovas have been found within galaxies, but how did these odd cases end up on solo hypervelocity flights through space? Looking more closely, Foley then noticed that all of the galaxies that had produced the runaway supernovas showed signs of merging – two galaxies colliding and rearranging into one big galaxy. That is when all the puzzle pieces fell together for Foley. "The velocities were incredible, on the order of 4.5 million miles per hour," Foley said. "There is only one way to get a binary star system moving that fast: a slingshot from a close flyby of a binary supermassive black hole. How do you get a binary supermassive black hole? Merge two galaxies." When the galaxies merge, their black holes form a binary system that disrupts the carefully orchestrated choreography of both galaxies. In the shuffle, sometimes a binary white dwarf system will encounter the binary black hole. "You have two dancing partners, they do-si-do, and one pair gets flung away," Foley said. "The white dwarf and its partner are ejected out like from a slingshot, and after traveling at a high speed for about 50 million years, explode out in the middle of nowhere. It's a complicated chain of events, but it turns out that it's actually a very logical path to this weird phenomenon of hypervelocity supernovas." Foley hopes that in the future, these types of supernovas can be used to find more binary supermassive black hole systems, which themselves are rare and interesting phenomena that could give insight into gravity, general and special relativity, quasars, dark energy and other mysteries of astronomy and physics. Illinois is already involved in several astronomy surveys that could be scoured for hypervelocity calcium-rich supernovas. "These supernovas could be the bread crumbs to find our way to these supermassive binary black holes, and we could potentially find them in much higher numbers," Foley said. The NASA image at the top of the page shows an artist’s concept of a Type Ia supernova exploding in an intergalactic region of space. Most supernovae are found inside galaxies containing hundreds of billions of stars, but lonely supernovae were found this past June by the Hubble Space Telescope between galaxies in three large clusters of several thousand galaxies each. Black Hole Collisions –"Astronomers 'Hear' Them Via Gravity Signals"
ALMA Observatory "Pierces Cosmic Fog of the Early Universe"
First Galaxies of the Universe –"Revealed By Glowing Carbon"